The prehistoric-looking tortoise charms many with its calm, gentle demeanor and unhurried pace. There are myriad species of tortoises worldwide, but the most popular types of pet tortoises are the Mediterranean and the Russian. Both types of tortoises kept as pets grow to be between 6 and 10 inches long and thrive in the same conditions. These pets typically live long lives but need proper pet tortoise care to stay healthy and happy. When considering how to care for a tortoise as a pet, your first consideration should be its habitat. Mediterranean and Russian tortoises are naturally suited for warm, arid climates. If you live in a region that offers plenty of warmth and sunshine for at least part of the year, you can keep your tortoise in an outdoor enclosure. However, when the weather turns cool or damp, it's time to bring it indoors. Your pen must be large enough to allow for adequate exercise. Reptile Magazine recommends a pen for one or two adults be at least 2 feet by 4 feet, with walls going 6 to 12 inches into the ground and extending 12 inches above ground. The enclosure must be secure enough to keep predators out and the tortoise in. Tortoise enclosures need to have areas of soft soil because tortoises like to dig burrows and tunnels. The enclosure needs a variety of areas such as rocks to climb on, shady plants to hide in, grassy sections, contoured surfaces, and edible vegetation. The pen should also have a sheltered area in case of rain or chilly weather. 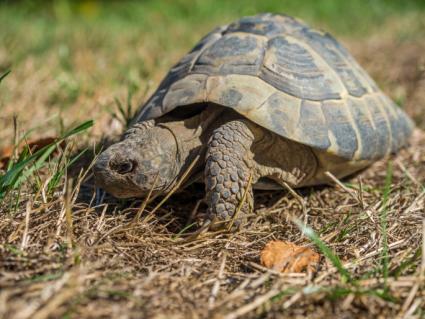 The Tortoise Trust recommends tortoises be kept outdoors as long as weather conditions permit. When it's time to bring your tortoise indoors the ideal enclosure is a structure called a tortoise table. These can be ordered ready-made from a pet supplier, but they are also an easy DIY project. Like the outdoor enclosure, it should be nearly 2 feet by 4 feet to allow for sufficient exercise. It should be equipped with a high-quality UVB reptile lamp to provide adequate heat and light. The lamp should be left on about 14 hours a day. It should have a base of materials, called substrate. The substrate needs to be deep enough for burrowing. A good rule of thumb is 2 inches in depth for small tortoises and 3 inches for large ones. A 50/50 mix of sand and soil makes an excellent substrate. Tortoises need foods high in fiber and calcium and low in protein, fat, sugar, and carbohydrates. A diet of green, leafy vegetation and flowers is best because this is the kind of diet a tortoise would eat in the wild. Tortoises especially love weeds like chickweed, dandelions, and clover. For special treats, they'll enjoy salad greens, grated carrots, and cucumber. Sprinkle your tortoise's food with a mix of calcium, vitamin D3, and trace minerals for optimal growth and health. You can buy these supplements from most pet stores and veterinarians. In addition, fresh water must be available to the tortoise at all times. It's important you help maintain your tortoise's good health by minimizing stress. Tortoises tend to become stressed when handled frequently. This can adversely affect their health and activity levels. Reptile Magazine's care sheet for Russian tortoises states this species, in particular, is more resistant to handling, though all tortoises should be handled sparingly. Don't let other pets "play" with your tortoise. Dogs are especially likely to cause injuries to tortoises. Confinement to a space that is too small also causes stress. Tortoises don't like to be pinned down or have their movements restricted in any way. Tortoises are considered exotic pets, and you'll need to find a veterinarian with experience caring for reptiles. Take your tortoise for an exam as soon as you bring it home to identify and treat any health issues it may have. Respiratory infections are generally treated with antibiotics. Check with your nearest herpetology group regarding ownership laws in your state. 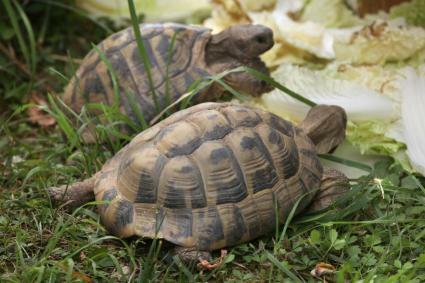 Some states require permits to own certain breeds of tortoises. A tortoise can live anywhere from 40 to 100 years, or even longer, so adopting one is a lifetime commitment. With careful attention to your pet's needs, you'll have an entertaining and endearing companion for years to come.